The mission of St. Aidan's is to make disciples by proclaiming Christ as Lord and making a difference in our community. Peace in heaven and glory in the highest. 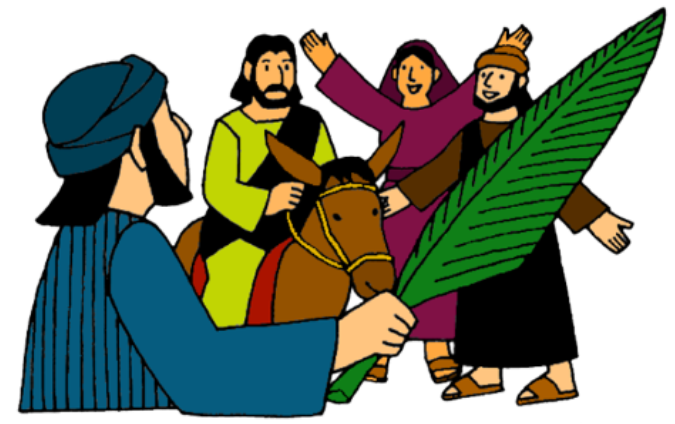 Our readings for Palm Sunday, including The Liturgy of the Palms are: Luke 19:28-40; Isaiah 50:4-9a; Psalm 31:9-16; Philippians 2:5-11; Luke 22:14-23:56. 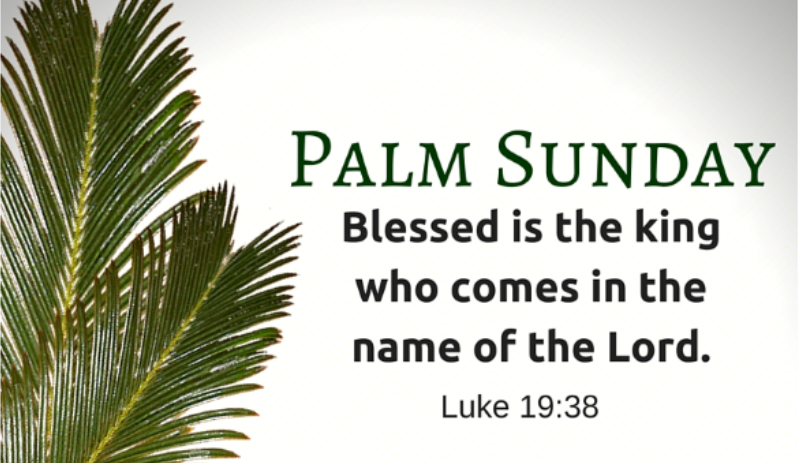 ﻿Click Here to view the Palm Sunday Lectionary Readings. The last week of Jesus’ ministry went from his triumphal entry into Jerusalem to his ignoble and forsaken death on a cross at Calvary. How did his first followers understand this dramatic reversal? On April 14 (Palm Sunday) we will be watching "Jesus: Countdown to Calvary" starring Hugh Bonneville (Robert Crawley, Earl of Grantham in "Downton Abbey") who has a theology degree from Cambridge. Please Remember: If you are unable to be at church on the Sunday you are assigned, please find a replacement - switch Sundays with someone. To View Updated March-April ROTA click here. Follow “The Way of Love” Lenten calendar available in the narthex and on-line; there are also be daily emails on Unison to the parish. 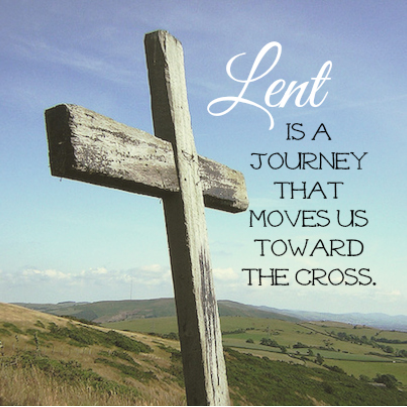 To view Lenten Calendar, click here. 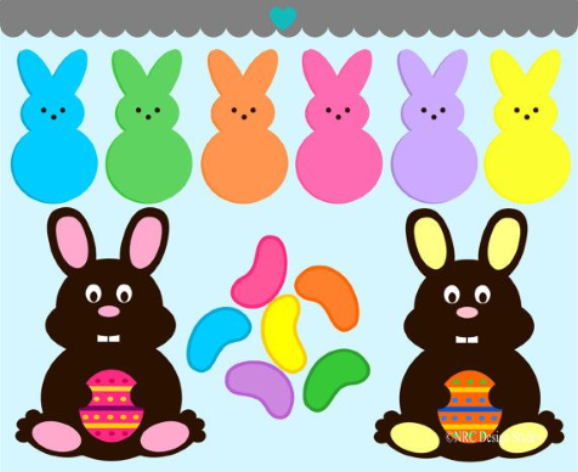 Time to bring those delicious candy morsels to church for our Annual Easter Egg Hunt after worship on Easter Sunday. We need individually wrapped pieces, preferably incredibly tasty and easy to open!! You can bring candy through Good Friday, April 19. There is a basket in the entryway for your gracious donations of candy. Thank you and God bless you. We are in the process of putting together a new picture Parish Directory, and this time you get to choose the photograph of yourself you would like included in the directory. Please email those photos to the church at staidansolathe@sbcglobal.net by Thursday, August 1. 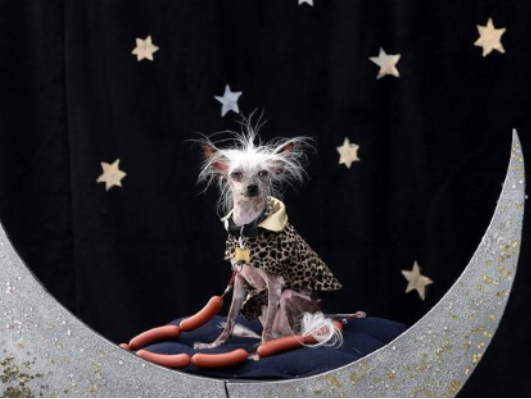 There is no truth to the rumor that if you do not submit a photo, a group of high school boys will scour the internet looking for silly pictures to use as your personal photo (check out this darling). Well, there might be some truth to the rumor, so please submit those photos for our new directory! Blessings. Don’t move that gently used winter coat to the back of the closet this Spring!! 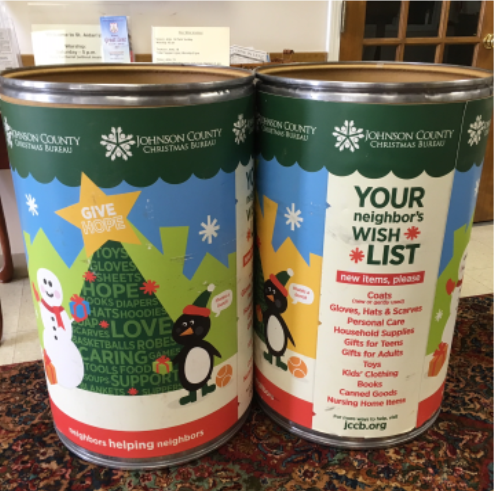 Bring it to St. Aidan’s and donate it to the Johnson County Christmas Bureau. ﻿Barrels for collecting coats are in the entryway. 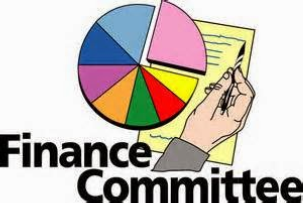 The Finance Committee is Meeting at 6 pm on Tuesday, April 16. BackSnack Packing is happening on April 17 with a Single Pack. 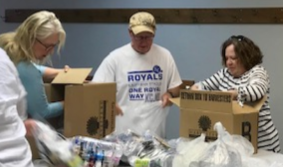 We pick up the boxes at the Resource Center down the street at 1:30 pm, and pack at 5 pm. Thanks to all our faithful packers and deliverers. 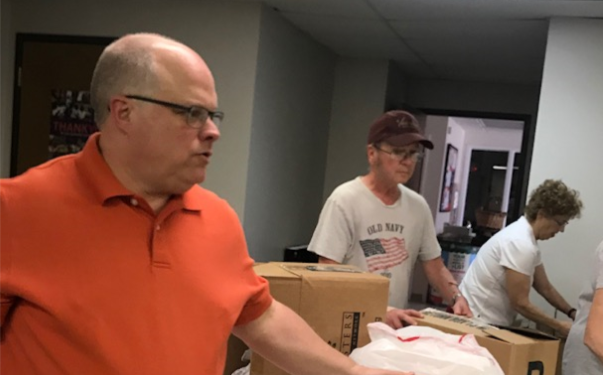 Please pitch in and help serve the Community Meal at the Center of Grace, 520 S Harrison, Olathe, this Thursday, March 28. Cooks at 1 pm, servers at 5 pm, and clean-up crew at 6 pm. And be sure to bring those desserts to the church by noon on Thursday!! 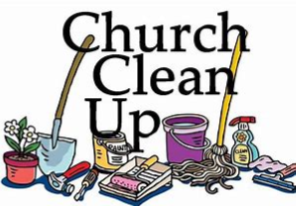 Thank you to all who helped with sprucing up the parish building and grounds in anticipation of our guests & newcomers on Easter Sunday. 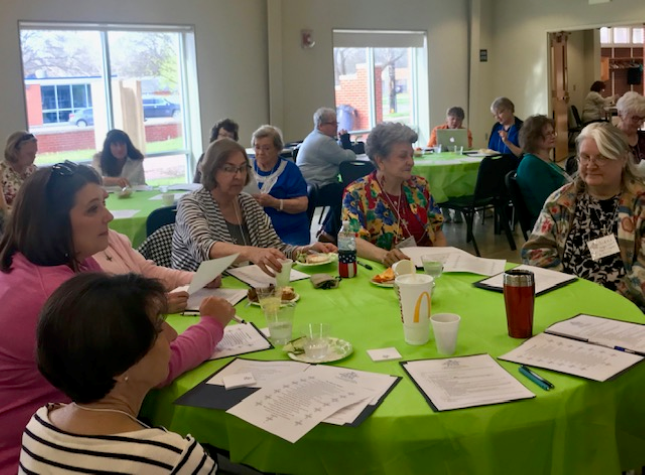 Several ladies from the St. Bridget's Chapter of the Daughters of the King attended the Spring Assembly in Topeka on April 6. 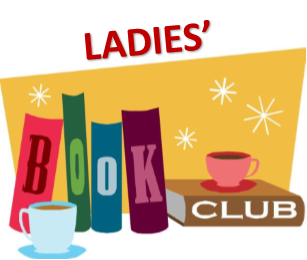 The monthly Daughters of the King meeting is on Sunday, April 14, at 11:15 am, after St. Aidan's morning worship service. The Bible Challenge: Available At A Computer or Phone Near You! Check out the daily emails with pithy and often bemused commentary as we read the Bible together: II Samuel, Psalms, and Acts this week. Please see Kayte Salvagni for more information. 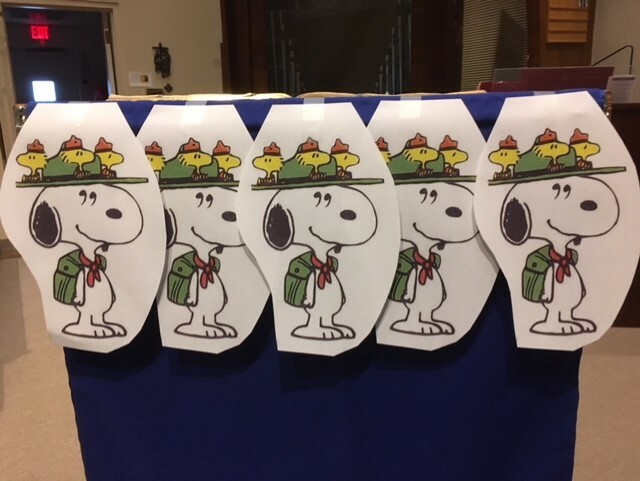 As a parish we look to the future of the Church and give the gift of Summer Episcopal MegaCamp to our campers by raising the money to cover all of their costs – please give generously to our young people! 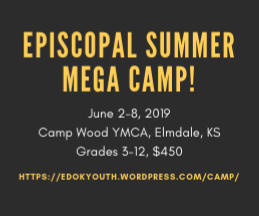 Who: Students in grades 3-12 for 2017-18 school year (you must have finished third grade to attend); Camp is NOT restricted to Episcopalians or regular churchgoers. All are welcome, so feel free to invite friends and family. So Easy Anyone Can Use It!! Check out the new improved parish email system accessible through our website – www.staidansolathe.org! 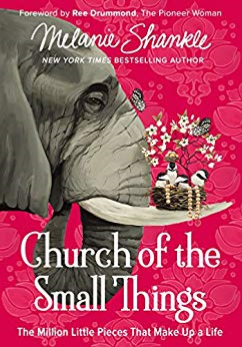 See Julie Wojtas (630 865-3931) for information about accessing this friendly parish email group. 8 pm - Al Anon. To view Final March 2019 Calendar, Click here. To view St. Aidan's April 2019 Calendar, click here. To view March 2019 Birthday and Anniversaries, click here. 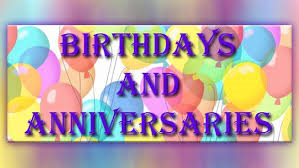 To view April 2019 Birthdays and Anniversaries, click here.